The philosophy behind the brand is to offer salon clients a comprehensive portfolio of products in order to present a solution for any hair problem, while presenting stylists with the instruments to provide the high quality services demanded. 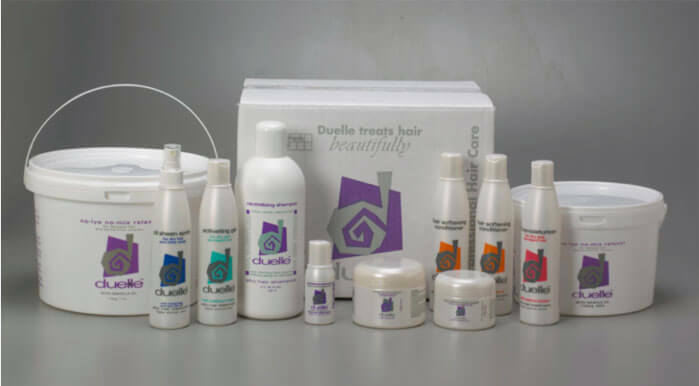 Duelle’s product range caters for all scenarios from state of the art low lye relaxers to itchy and dry scalp remedies. We want to supply the hairdressers with a range of products which are tools for their craft, thereby allowing them to confidently use Duelle, knowing that their results are going to be guaranteed. With the maintenance and home-care products, salons gain the opportunity to increase their income by selling this impeccable range to their clients without having to compete with retailers.